Resident in the Department of Family and Community Medicine at St Michael’s Hospital and in the Public Health and Preventive Medicine Residency Program at the University of Toronto in Ontario. Occupational medicine specialist in the Department of Occupational and Environmental Health at St Michael’s Hospital and Associate Professor Emeritus in the Department of Occupational and Environmental Health at the University of Toronto. Objective To provide family physicians with an understanding of the epidemiology, pathogenesis, symptoms, diagnosis, and management of hand-arm vibration syndrome (HAVS), an important and common occupational disease in Canada. Sources of information A MEDLINE search was conducted for research and review articles on HAVS. A Google search was conducted to obtain gray literature relevant to the Canadian context. Additional references were obtained from the articles identified. Main message Hand-arm vibration syndrome is a prevalent occupational disease affecting workers in multiple industries in which vibrating tools are used. However, it is underdiagnosed in Canada. It has 3 components—vascular, in the form of secondary Raynaud phenomenon; sensorineural; and musculoskeletal. Hand-arm vibration syndrome in its more advanced stages contributes to substantial disability and poor quality of life. Its diagnosis requires careful history taking, in particular occupational history, physical examination, laboratory tests to rule out alternative diagnoses, and referral to an occupational medicine specialist for additional investigations. Management involves reduction of vibration exposure, avoidance of cold conditions, smoking cessation, and medication. Conclusion To ensure timely diagnosis of HAVS and improve prognosis and quality of life, family physicians should be aware of this common occupational disease and be able to elicit the relevant occupational history, refer patients to occupational medicine clinics, and appropriately initiate compensation claims. Hand-arm vibration syndrome is substantially underrecognized in Canada.3 A lack of appropriate and timely diagnosis and referral by primary care physicians appears to be an important reason for treatment delay.4,5 Workers’ lack of awareness and fear of reprisals by employers are additional barriers.5,6 This underdiagnosis is problematic, as early recognition and management of this condition are crucial for preventing progression and improving prognosis. Currently, only 2 of the 13 provinces and territories, British Columbia and New Brunswick, have legislation that specifically limits occupational hand-arm vibration exposure. Even in these provinces, it is unclear to what extent the regulations are enforced.3 Therefore, family physicians play an important role in identifying cases of HAVS early and advocating for appropriate management. 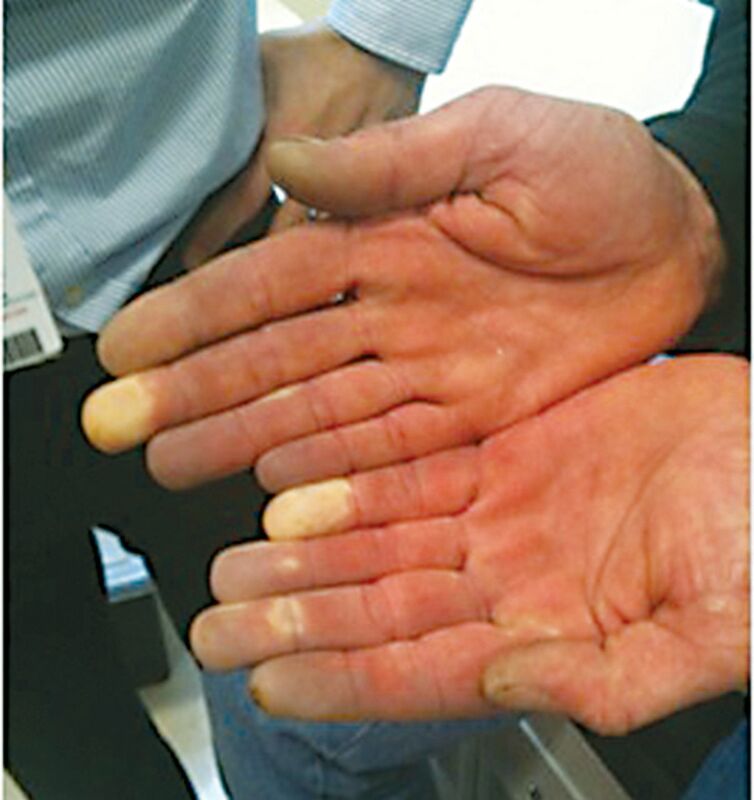 A 30-year-old man visited his family physician for cold-induced blanching and pain in his fingers, which started in the right third and fourth digits and spread to all digits bilaterally over a period of 3 years. He also mentioned concomitant finger numbness and tingling. He had no history of cardiovascular or neurologic disease, diabetes mellitus, thyroid disease, arthritis, or connective tissue disease. He also had no history of frostbite or carpal tunnel syndrome (CTS). There was no family history of primary Raynaud phenomenon or connective tissue disease. He was not taking any medications. He was a smoker with a 15 pack-year history. He had worked as an underground miner for 10 years and had used hand-held, high-intensity vibrating tools, including large drills and air chisels, on a regular basis. He had normal vital signs and no remarkable findings on cardiovascular, neurologic, and musculoskeletal examinations. He was referred to an occupational medicine clinic for further assessment of possible hand-arm vibration-induced injury. The Ovid MEDLINE database was searched up to June 1, 2016, for articles pertinent to epidemiology, pathogenesis, symptoms, diagnosis, prognosis, and management of HAVS. Search terms included hand-arm vibration syndrome, HAVS, and vibration white finger. Reference lists of articles identified were also checked for additional articles. A separate Google search was conducted to obtain gray literature relevant to the Canadian context. High-frequency vibration, such as that produced by certain drills, chisels, milling machines, saws, and cutting, sanding, and polishing machines, is largely absorbed by the fingers and hands and appears to be associated with the vascular and sensorineural symptoms of HAVS.16 In contrast, vibration of lower frequencies is transmitted to the arms and shoulders and might be associated with musculoskeletal abnormalities in these areas. Raynaud phenomenon in hand-arm vibration syndrome: The phenomenon typically affects the dominant hand first. Other less well characterized HAVS symptoms include those of digital sensory neuropathy—finger tingling, numbness, and paresthesia independent of exposure to cold, with less night waking compared with CTS; and musculoskeletal symptoms, in particular reduced grip strength15,22 and Dupuytren contracture.23 The association between vibration exposure and other musculoskeletal outcomes, although reported, is unclear owing to the confounding effect of ergonomic stressors related to manual work. Hand-arm vibration syndrome is a diagnosis of exclusion. Primary Raynaud phenomenon and other causes of secondary Raynaud phenomenon should be ruled out. Primary Raynaud phenomenon often occurs before 30 years of age, especially among women and those with a positive family history.17 Common causes of secondary Raynaud phenomenon include autoimmune rheumatic diseases (eg, systemic lupus erythematosus, rheumatoid arthritis, dermatomyositis, scleroderma); hematologic diseases (eg, cryoglobulinemia, cold agglutinin disease); peripheral vascular diseases; thoracic outlet syndrome; vasoconstricting medications such as β-blockers, ergotamine, and clonidine; occupational or environmental exposure such as vinyl chloride monomer or frostbite; and other associated conditions such as CTS and hypothyroidism. Carpal tunnel syndrome, which often exists in patients with HAVS and for which hand-arm vibration might be an independent causal factor,24,25 should be considered in those presenting with sensorineural symptoms. History of work-related and non–work-related vibration exposure, including cumulative duration, intensity, and type of vibration tool used, should be obtained.26,27 Other occupational risk factors, such as workplace temperature, rest breaks, posture, and grip force, might also be obtained.18 History of smoking, which is a risk factor for VWF, should be elicited. Physical examination includes assessment of cardiovascular, neurologic, and musculoskeletal systems.13,31 Vital signs should be measured and a precordial examination should be performed. The Allen test assesses radial and ulnar circulation and the Adson test is used to rule out vascular thoracic outlet syndrome. Examination of sensation, including pinprick, 2-point discrimination, or monofilament tests, and upper extremity strength, including grip strength, should be conducted. Tinel and Phalen tests might be performed to diagnose CTS. Palmar thickening and finger contractures should be noted. If HAVS is suspected, patients should be referred to an occupational medicine specialist for further investigations, especially if symptoms are severe or if work-related compensation is sought. Although there is currently no standardized diagnostic test for HAVS,2 additional investigations might be ordered by specialists to objectively measure severity, rule out other causes, and guide management. Objective evidence of the condition might also facilitate compensation claims and the implementation of workplace modifications. Vascular assessments might include digital plethysmography, which detects differences in finger pulse waveforms before and after cold water stress, and thermometry or thermography, which detects recovery of finger temperature after cold provocation.17 Upper extremity arterial Doppler ultrasound might also be performed to rule out large vessel obstructive lesions. Nerve conduction testing, which assesses the function of large myelinated nerve fibres proximal to the fingers, helps rule out median and ulnar nerve compression. Quantitative sensory tests, such as current perception threshold, vibration perception threshold, and temperature perception threshold, might also be performed to measure function of small digital nerve fibres. For assessment of musculoskeletal features, grip strength is assessed using a grip dynamometer. The Purdue Pegboard Test is often used to assess overall dexterity and hand function. Compensation claims should be initiated after discussion with patients, especially as it might lead to better recognition and control of workplace vibration exposure. Attention should be paid to VWF, the vascular component of HAVS, as it is recognized by all compensation boards in Canada.3 Reduction of hand-arm vibration exposure is the best management strategy for HAVS and might increase the likelihood of work continuation.1 If exposure cannot be avoided, it might be reduced through engineering control, personal protective equipment, and work practice changes.32 Well-maintained low-vibration tools and antivibration gloves approved by the International Organization for Standardization can be used.8 Exposure might also be reduced by introducing breaks during vibration exposure (eg, for 10 minutes every hour) and minimizing grip force to what is required for safe operation of the vibrating tool. Avoidance of cold exposure and use of protective clothing might prevent Raynaud phenomenon attacks.8 Smoking cessation should be encouraged. In more severe cases, medical treatment with a calcium channel blocker might be helpful. For patients with chronic hand pain associated with HAVS, pain management should be a priority. The occupational medicine specialist ordered laboratory tests for other common causes of Raynaud phenomenon, the results of which were negative. Digital plethysmography revealed moderate to severe dampening of right finger waveforms and moderate dampening of left finger waveforms after cold water immersion. Extremity arterial Doppler ultrasound, nerve conduction testing, current perception threshold of the fingers, grip strength, and the Purdue Pegboard Test results revealed no substantial abnormality. The investigations confirmed the presence of the vascular component of HAVS, which was moderate to severe in nature. Neurologic and musculoskeletal components of HAVS were not detected. The patient was encouraged to reduce hand-arm vibration exposure, avoid cold exposure, and quit smoking. A trial of a calcium channel blocker was recommended. A compensation claim was submitted. His symptoms will be monitored and work modification and retraining might be considered if his clinical condition continues to worsen. This case shows that even younger individuals might be affected by HAVS if they are exposed to daily high-intensity vibration and that different components of HAVS might occur separately. Family physicians should consider the possibility of HAVS, a common occupational disease, when patients with hand-arm vibration exposure, especially of more than 2 years’ duration, present with Raynaud phenomenon or neurologic symptoms of the hands. Appropriate and timely assessment, referral, and compensation initiation are crucial for improving the prognosis and quality of life of workers. Hand-arm vibration syndrome is a common occupational disease that affects workers in multiple industries. However, it is underrecognized in Canada. Assessment includes taking an occupational history and performing physical examinations and laboratory tests to rule out other causes. If hand-arm vibration syndrome is suspected, referral to an occupational medicine specialist is required for further investigations. Management includes vibration exposure reduction, cold avoidance, smoking cessation, and initiation of a calcium channel blocker. La traduction en français de cet article se trouve à www.cfp.ca dans la table des matières du numéro de mars 2017 à la page e160.
. Hand-arm vibration syndrome: a common occupational hazard in industrialized countries. J Hand Surg Eur Vol 2011;36(5):354-63. Epub 2011 Feb 10.
. Diagnostic aspects of vibration-induced white finger. Int Arch Occup Environ Health 2002;75(1–2):6-13.
. Compensation of hand-arm vibration syndrome in Canada. Int J Soc Secur Workers Compens 2011;3(1):21-8.
. Socio-medicinal aspects of vibration-induced white finger disease. Disabil Rehabil 2008;30(14):999-1013.
. Healthcare barriers for workers with HAVS in Ontario, Canada. Occup Med (Lond) 2015;65(2):154-6. Epub 2015 Jan 16.
. The compensation experience of hand-arm vibration syndrome in British Columbia. Occup Med (Lond) 2012;62(6):444-7. Epub 2012 Jun 1.
. The hazards of HAVS. Occup Health Saf 1998;67(12):45-6.
. Occupational disease prevention strategy. Hand-arm vibration syndrome. Toronto, ON: Occupational Health Clinics for Ontario Workers; 2015. Available from: www.ohcow.on.ca/edit/files/news/16102015/HAVS_Prevention%20Strategy%202011.Edited%20and%20Revised.2015.R.March27.R.House.FINAL.pdf. Accessed 2017 Jan 27.
. The NIOSH review of hand-arm vibration syndrome: vigilance is crucial. National Institute of Occupational Safety and Health. J Occup Environ Med 1998;40(9):780-5.
. White fingers, cold environment, and vibration—exposure among Swedish construction workers. Scand J Work Environ Health 2010;36(6):509-13. Epub 2010 Jun 22.
. Work ability in vibration-exposed workers. Occup Med (Lond) 2014;64(8):629-34. Epub 2014 Aug 21.
. Hand pain other than carpal tunnel syndrome (CTS): the role of occupational factors. Best Pract Res Clin Rheumatol 2011;25(1):31-42.
. The clinical assessment of hand-arm vibration syndrome. Occup Med (Lond) 2003;53(5):337-41.
. Current pathophysiological views on vibration-induced Raynaud’s phenomenon. Cardiovasc Res 2003;57(3):615-24.
. Hand muscle pathology after long-term vibration exposure. J Hand Surg Br 2004;29(5):431-7.
. Hand-arm vibration syndrome. Toronto, ON: Workplace Safety and Insurance Appeals Tribunal; 2010. Available from: www.wsiat.on.ca/english/mlo/havs.htm. Accessed 2017 Jan 27.
. The pathogenesis, diagnosis and treatment of Raynaud phenomenon. Nat Rev Rheumatol 2012;8(8):469-79. Epub 2012 Jul 10.
. Diagnosis and treatment of hand-arm vibration syndrome and its relationship to carpal tunnel syndrome. Aust Fam Physician 2003;32(7):530-4.
. The Stockholm Workshop scale for the classification of cold-induced Raynaud’s phenomenon in the hand-arm vibration syndrome (revision of the Taylor-Pelmear scale). Scand J Work Environ Health 1987;13(4):275-8.
. Vasospasm in the feet in workers assessed for HAVS. Occup Med (Lond) 2011;61(2):115-20. Epub 2010 Dec 31.
. The relationship between hand-arm vibration and lower extremity clinical manifestations: a review of the literature. Int Arch Occup Environ Health 2002;75(3):179-85.
. Hand-grip force in lumberjacks: two-year follow-up. Int Arch Occup Environ Health 1986;58(3):203-8.
. Should we consider Dupuytren’s contracture as work-related? A review and meta-analysis of an old debate. BMC Musculoskelet Disord 2011;12:96.
. Carpal tunnel syndrome and its relationship to occupation: a meta-analysis. Rheumatology (Oxford) 2012;51(2):250-61. Epub 2011 May 17.
. Association between work-related biomechanical risk factors and the occurrence of carpal tunnel syndrome: an overview of systematic reviews and a meta-analysis of current research. BMC Musculoskelet Disord 2015;16:231.
. Measurement, evaluation, and assessment of occupational exposures to hand-transmitted vibration. Occup Environ Med 1997;54(2):73-89.
. Exposure assessment in health assessments for hand-arm vibration syndrome. Occup Med (Lond) 2011;61(5):374-6.
. Sensorineural stages of the hand-arm vibration syndrome. Scand J Work Environ Health 1987;13(4):279-83.
. Use of color charts for the diagnosis of finger whiteness in vibration-exposed workers. Int Arch Occup Environ Health 2008;81(5):633-8. Epub 2007 Sep 22. Risk of occupational exposures: VIBRISKS. Final technical report. European Commission; 2007. Quality of Life and Management of Living Resources Programme. Available from: www.vibrisks.soton.ac.uk/reports/VIBRISKS%20Final%20Technical%20Report%20210907.pdf. Accessed 2017 Jan 27.
. Clinical assessment of musculoskeletal disorders in workers exposed to hand-arm vibration. Int Arch Occup Environ Health 2002;75(1–2):97-105. Vibration syndrome. Atlanta, GA: Centers for Disease Control and Prevention; 1983. Available from: www.cdc.gov/niosh/docs/83-110/default.html. Accessed 2017 Jan 27.
. The effect of hand-arm vibration syndrome on quality of life. Occup Med (Lond) 2014;64(2):133-5. Epub 2014 Feb 2.
. Quality of life (EQ-5D) and hand-arm vibration syndrome. Int Arch Occup Environ Health 2010;83(2):209-16. Epub 2009 Jul 11.
. Quality of life in Swedish workers exposed to hand-arm vibration. Occup Ther Int 2007;14(3):156-69.
. An interpretative phenomenological analysis of the psychological ramifications of hand-arm vibration syndrome. J Health Psychol 2010;15(4):533-42.
. Occupational exposure to vibration from hand-held tools. A teaching guide on health effects, risk assessment and prevention. Teaching materials. Geneva, Switz: World Health Organization; 2011. Available from: www.who.int/occupational_health/pwh_guidance_no.10_teaching_materials.pdf. Accessed 2017 Jan 27.
. Dose-response relationship between exposure to hand-arm vibration and health effects among metalworkers. Ann Occup Hyg 2009;53(1):55-62. Epub 2008 Nov 14.
. Longitudinal study on factors related to the course of vibration-induced white finger. Int Arch Occup Environ Health 1997;69(3):180-4.
. Long-term follow-up study on patients with vibration-induced white finger (VWF). J Occup Environ Med 2002;44(12):1203-6.